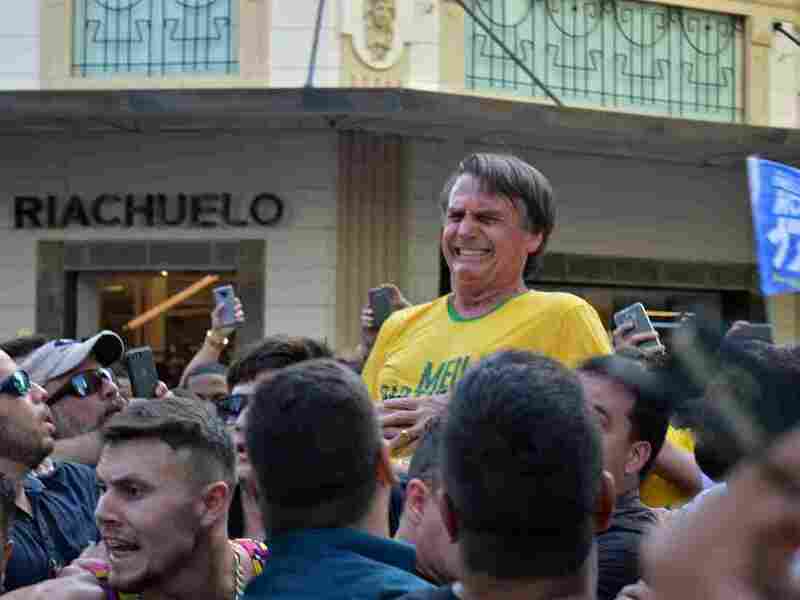 Brazil's Presidential Front-Runner Is Seriously Wounded In Attack At Campaign Rally Jair Bolsonaro was attacked as he was being carried on the shoulders of supporters in southeastern Minas Gerais state. Doctors say it could take months for him to fully recover. Brazilian right-wing presidential candidate Jair Bolsonaro gestures after being stabbed in the stomach during a campaign rally in Juiz de Fora, Minas Gerais state, in southern Brazil, on Thursday. Video of the incident shows Bolsonaro giving a thumbs-up just before being stabbed. The candidate appears to grimace, then double over in pain. He is then lowered and quickly bundled into a car. Police say they have arrested a 40-year-old man identified as Adelio Obispo de Oliveria in connection with the stabbing. Reuters quotes officials as saying the suspect appeared to be mentally disturbed. According to reports, doctors say it could take Bolsonaro up to two months to fully recover and that he would be in the hospital for at least a week — throwing the rest of the campaign into question. "His internal wounds were grave and put the patient's life at risk," said Dr. Luiz Henrique Borsato, who operated on the candidate, according to Reuters. The doctor said the biggest challenge for medical staff would be preventing an abdominal infection. Bolsonaro has sparked outrage among many in Brazil for his racist and homophobic comments on the campaign trail. Even so, he has remained strong in the polls. His would-be closest rival, former President Luiz Inácio Lula da Silva, has been disqualified from the race after being convicted of corruption. Bolsonaro is well ahead of other presidential hopefuls in the opinion polls. They include former Senator Marina Silva and Gerald Alckmin, a former governor of São Paulo. As Reuters notes, "The attack on Bolsonaro, 63, is a dramatic twist in what was already Brazil's most unpredictable election since the country's return to democracy three decades ago. Corruption investigations have jailed scores of powerful businessmen and politicians in recent years, and alienated infuriated voters."